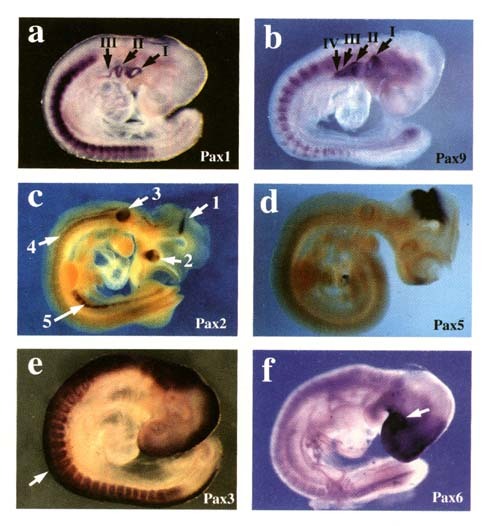 Pax genes are developmental control genes that encode transcription factors. Their fundamental role in animal development is illustrated by genetic studies. Loss-of-function mutations are known to cause specific developmental defects. In addition, gain-of-function mutations have been implicated in cancer. In order to gain insight into the molecular mechanisms underlying Pax gene function, it is necessary to define Pax target genes, identify proteins that modulate properties of Pax transcription factors by direct physical interaction and uncover the basis of the haploinsufficiency phenomenon. With their multiple functions during development in various animal phyla, Pax genes can serve as a paradigm (model example) of how transcription factors control development. In addition, due to high Pax gene conservation throughout the metazoan kingdom it is possible to study how the individual gene functions have been modified during the course of evolution. In fact, by focusing on one gene family in well-defined systems one can hope to contribute to the better understanding of mechanisms underlying evolution, development and disease in general. Anatomically widely different designs of animal eyes have long been thought to arise independently multiple times during evolution. 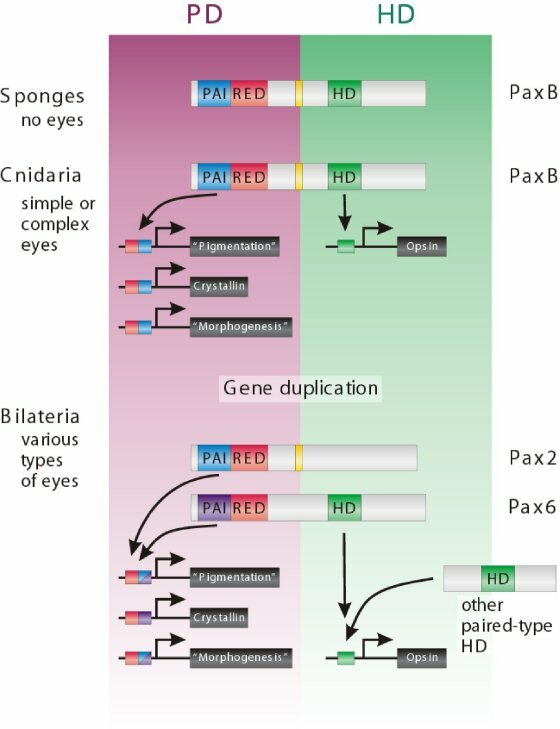 This view has been challenged about a decade ago by the landmark discoveries that a highly conserved transcription factor Pax6 plays a key role in eye morphogenesis both in flies and mammals. Since then, more evidence has emerged for redeployment of Pax6 and some other developmental control genes in the genetic programme underlying eye formation throughout the animal kingdom. Apart from Pax6, additional Pax proteins are essential for normal eye development in Drosophila and mice (see Table). For instance, two Drosophila Pax6-like genes, eyg and toe may act in parallel to ey during eye formation. Recent results suggest distinct but coordinated roles for ey and eyg. In the current view, Ey provides eye specification while eyg regulates proliferation being genetically downstream of Notch signaling, a known regulator of eye growth. The origin of Pax genes predates the origin of eyes or even nervous system. The ancestral Pax gene (PaxB) related to Pax2/5/8 was identified in the sponge that has neither eyes nor the nervous system. Cnidaria are the most basal animals that posses either simple or complex (lens containing) eyes as well as Pax genes. PaxB gene in a cnidarian Tripedalia is expressed in lens and retina and is able to activate both lens crystallin as well as opsin reporter genes (Kozmik, 2003). The data indicate that modern Pax2 and Pax6 genes evolved from a cnidarian PaxB ancestor by duplication and diversification in Bilateria. Pax2 lost its HD while Pax6 lost the octapeptide (yellow box) and changed the DNA-binding specificity of PD by acquiring amino acids I42, Q44 and N47, respectively (shown by violet color of PAI domain and the target sequence). The early Pax HD function in opsin gene regulation has been modified in some Bilateria by co-option of other paired-type HD proteins (such as Otd or Crx).